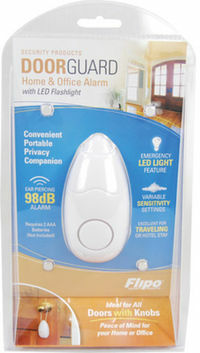 The DOOR GUARD ALARM 98db with Flashlight is a very versatile shock sensor alarm. 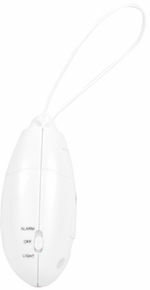 Ideal for home, office, hotel, or travel. This alarm requires no installation, simply hang it on any doorknob. Once hung, it instantly detects any vibration. When the alarm is tripped, it will emit a 98dB alert for 20-30 seconds, then will reset in 3-5 seconds. The sensitivity of the alarm is easily adjusted with a screwdriver. The Door Guard can be removed from the doorknob and used as an area light with the switch in the 'light' position. The Door Guard is ideal for keeping you and your loved ones safe from harm. The Door Guard is compact, making it portable so you can take it with you when you travel. It is ideal for anyone and can be used virtually anywhere. Not sure about that shady looking hotel, but can't beat the price, feel confident and safe.